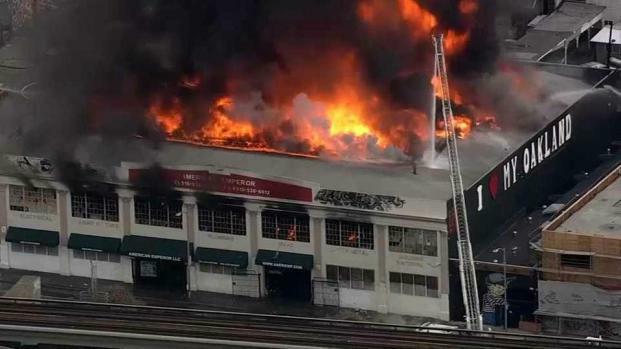 Firefighters battled a raging three-alarm blaze at a large warehouse in Oakland Monday morning, according to the city's fire department. Flames engulfed the construction supply warehouse located at 1900 E. 12 St., but no injuries were reported, Melinda Drayton with the Oakland Fire Department said. Twenty people — a mix of employees and customers — were inside the warehouse when the fire broke out, but they all managed to escape on their own, the fire department reported. Drayton said the fire initially started around 8:20 a.m. outside the warehouse on Solano Way before spreading into the building through an open window. The cause of the fire is under investigation. Firefighters battled a raging three-alarm blaze at a large warehouse in Oakland Monday morning, according to the city's fire department. Bob Redell reports. At the height of the blaze, towering flames could be seen shooting out of the warehouse, spewing a thick plume of black smoke into the air that could be seen for miles. The warehouse belongs to American Emperor, a company that supplies electrical equipment, plumbing equipment, lighting fixtures and other building materials. At least 17 people living in apartments behind the warehouse had to evacuate due to the hazardous smoke and remained displaced late Monday because the back wall of the warehouse was in danger of collapsing, officials said. Roughly 50 firefighters responded to fight the fire, according to Drayton.